Kim Jong Il, the totalitarian dictator of North Korea, is dead at the age of 69 (coincidentally, the same age as Usama bin Laden and Muammar Qaddafi when we shuffled off their mortal coils). The dynastic ruler since 1994 when he inherited his position from his father Kim Il Sung, who was uniquely responsible for the Korean War, Kim Jong Il extended his state-wide megalomania to a tragically absurd degree. Whenever his name was mentioned in print, it had to be in bold type and had to include at least one honorific title. Kim-watchers have collected some 54 of them, including ‘Dear Leader’ (his most commonly known here in the West), ‘Great Leader’ (typically reserved for his father but used for the last several years), ‘Sun of the Communist Future’, ‘Ever Victorious, Iron-Willed Commander’, ‘The Great Sun of Life’, ‘Glorious General, Who Descended from Heaven’, ‘Highest Incarnation of the Revolutionary, Comradely Love’, and one of my favourites, ‘Dear Leader, who is a perfect incarnation of the appearance that a leader should have’. The official state hagiographies include such items as his birth being on Mount Paekdu, the highest point in Korea (as opposed to near Khabarovsk in 1941, where his father was a Soviet battalion commander at the time) and was accompanied by an announcement by a swallow, a double rainbow, and the appearance of a new star in the heavens. He began to walk at three weeks and speak at eight weeks. He would frequently lecture, correct and criticise his teachers (though in actuality much of his early education was in China, and he spent some time at the University of Malta learning foreign languages under the protection of the Maltese Prime Minister Dom Mintoff, also a loyal friend of Libya’s Muammar Qaddafi). Other claims include his invention of the hamburger, playing golf with a score of 38 under par in his first attempt (with 11 holes-in-one) before becoming bored of it, and bowling a perfect score of 300 his first time out. And he had no need to defecate. This official worship of the North Korean leader (like his father before him) is exemplified by video scenes of the shock expressed by the people at his passing, as provided here by Reuters. I am first struck by several scenes being caught by film crews who had the extreme good fortune of being in place to observe the reactions of the people when they were first told of the news. Another scene shows how mourners express their grief while lined up in formation before one of Kim’s shrines (if this were Israel they would probably rend their garments in unison), followed by the commentator, his voice devoid of whimsy, shifting to a drama academy (the actor here is actually quite impressive, but I was focused on the gentleman behind him, in a morbidly fascinating state of catatonia). It strains the limits of irony to consider how all this occurs in a political philosophy that is officially atheist. This unalloyed satisfaction at the passing of one of the world’s most pathological dictators is tempered by the facts surrounding the extreme deterioration of the country, which had received necessary outside aid from the Communist world to sustain the dictatorship until the collapse of the Soviet empire and the change of the Chinese economy. A series of massive floods “of biblical proportions” devastated the country in the mid-1990s, but the inability of the North to function on its own meant that it has never been able to recover. Estimates are that up to 3.5 million of 22 million people have starved as a result, with the national radio broadcasting recipes for cooking grass, if any can be still found on the increasingly barren landscape, also stripped of trees for fuel. A satellite photo of the Korean peninsula is highly illustrative of the comparison between the North and South, with only the capitol of Pyongyang barely showing up in an economically Stygian darkness. The only part of the society that still functions to any degree of success is the military. Under Kim’s policy of ‘Songun’, or ‘military first’, it receives adequate rations from foreign aid, and this has helped the regime keep its protector in primary place. In turn, North Korea has plowed whatever economic capability it has left into developing a nuclear weapons capability. This still primitive yet adequate enough industry, coupled with cooperation with such countries as Pakistan and Iran, is still working on a missile delivery system, but this is still enough to blackmail the outside world into providing more aid to support the regime. In exchange for promises to curtail its nuclear power (and weapons-grade nuclear material enhancement) industry, in 1995 President Clinton agreed to supply crude oil to the North, paid for out of the US defense budget, as reported by former Secretary of Defense Caspar Weinberger. Later, President George W Bush sought to cut back on aid in an effort to effect some control over negotiations in the Chinese-brokered ‘six party talks’ but was unsuccessful. The North was at the same time building a nuclear reactor in Syria, and “not for peaceful purposes”, until it was destroyed by an Israeli air strike in 2007. In contrast, the Obama administration has removed the DPRK from the list of "specially designated countries" that have shown a tendency to "promote, produce, or protect terrorist organizations or their members". Kim Jong Il’s death sees that his chosen successor of his youngest son, Kim Jong Un, takes place without the long period of preparation that was planned. The newest Kim is not solidified into place, and it is thought that he shares power with his uncle (Kim Jong Il’s brother-in-law) Chang Sung Taek, who serves as either regent and/or competitor, as well as his aunt (Kim Jong Il's sister, Chang's wife) Kim Kyong Hui, both of whom having done penance about ten years ago by being politically ostracised but now brought home in recent years. Nevertheless, the North can still buy time and play the outside world to its satisfaction, realising that the American public is weary, whether for good or ill, of large military efforts in this latest war with Islamic Supremacists, and the irony is not lost on the fact that Kim Jong Il’s death coincides with the last American soldier departing from Iraq. The DPRK regime knows that Obama in particular will avoid confrontation at any cost. China is the North’s closest ally (if such a term can be used) but it is fearful of the enormous dislocation that a North Korean collapse will entail. 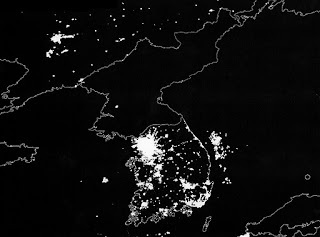 There is a large population of ethnic Koreans in Manchuria across the border from Korea, and Chinese culture regards them in somewhat the same light that some here in the West still regard the Jews (or perhaps Gypsies might be a better model) and does not relish a flood of starving Korean refugees across the Yalu River. South Korea has been closely studying the German reunification as a model since it started in 1989, but a North Korean collapse would be expected to be a problem several magnitudes greater. Yet we still expect to gut the US military budget in a scramble for another amorphous 'peace dividend' from cutting back our efforts in Iraq and Afghanistan, hoping to help pay for massive stimulus inputs into our economy from which the military did not benefit. This is still a very dangerous world indeed, and we still need to contend with a belligerent Iran, a tenuous Pakistan, and the possible collapse of the Euro, just to name a few, in addition to the problem of North Korea. We are whistling past the graveyard if we continue to ignore these very real possibilities. The phenomenon of hero-worhip stretches our ability to relate. It really does serve as an example of the strength of cradle to grave brain washing. It is very sad to think about how many lives have been a complete and total waste under this dehumanizing system. This will serve as a true test of which devil we lay down with. Do we let the Chinese take over the cost of feeding and clothing these pitiful citizens or do we lend ever increasing aid to assist in the reunification of the peninsula? What do we do if China objects to our influence? Without a modern day MacArthur we will probably be faced with paying billions of tax dollars just to see the aid money go into the coffers of the Chinese. Obama is entirely clueless and I think this situation will not settle into the background easily.